By Carl Slaughter: Newly promoted Escape Pod co-editors Divya Breed and Mur Lafferty give us the inside story on the magazine and their careers. Carl Slaughter: What did Escape Pod look like in the beginning, how has it evolved, and what’s the vision for the future? Mur Lafferty: Escape Pod was a one-person show, run entirely by Serah (then Steve) Eley. She covered all of the work from slush reading to audio production to hosting to web design, and it was a huge job. Serah’s focus was to deliver fun science fiction, with the meaning of fun open to interpretation, but, like obscenity, you know it when you see it. It was the first podcast magazine, driven only by online donations. The show hasn’t really changed a lot since those early days, nearly 600 episodes ago. It’s still one story per week, we still have the same Creative Commons license, and we still have music from Daikaiju. Some changes have included paying SFWA pro rates for original stories and paying narrators, not to mention the show doing well enough to branch off other shows focused on other genres. Different editors have also brought different visions to the magazine, sometimes veering away from “fun,” sometimes coming back to it. I think looking forward Divya and I just want to present a good story. That sounds so simple, doesn’t it? Divya Breed: I suspect Mur has a better handle on Escape Pod’s history than I do, having been around for much more of it! In terms of the future, we are indeed looking for whatever tickles our fancy, and I can say safely that so far, we’re generally in agreement on what that means. We enjoy publishing new authors, we’ll be soliciting stories, especially from up-and-coming authors, and we’ll continue to highlight classics for some of our special episodes. CS: How is the site different since the last time Mur was at the helm? ML: We have a bigger staff now, and the incredible workload is spread among many people. I keep having the feeling that “Oh crap, I didn’t do X for the show,” and then remember that X is someone else’s job. It makes the actual editorial job easier when I don’t need to worry about finding narrators, or production, or the website. CS: You’re listed as co-editors. Is there an official or implied chief co-editor. Does Divya take the lead because she was part of the current regime when Mur arrived? Does Mur take the lead because she has more podcast experience. Am I reading too much into this? Is it more like 2 editors getting into the groove with each other? DB: You are definitely reading too much into it! [insert me laughing] It’s an equal partnership at the top right now. When Norm decided that it was time for him to focus on other parts of his life, I had been working as the Assistant Editor of Escape Pod for less than a year. Between that and my writing career, I didn’t want to take on an editor-in-chief role without some backup. Mur was my ideal choice, having plenty of experience in the editor’s chair, but also being an author herself and therefore understanding how to balance the two roles. We are getting into the groove of things, and we do our best to keep the bumps in the road from becoming unpleasant for our audience. And I confess: a good portion of our monthly meeting revolves around non-Escape Pod related conversation, like writing, conventions, and family. I’ll quote Casablanca: I think this is the beginning of a beautiful friendship. ML: I came into this with the editorial and EP experience, but have been away for a while, and Divya knows how the machine is working now. So while she’s made some of the decisions regarding staff (ie, promoting our new Assistant Editor, Ben Kinney), we are equals with regards to editorial decisions. CS: How has editing duties affected your own writing and other ambitions? ML: Not so much, I don’t think. I usually try to do my EP work in batches, so a few days are all focused on EP, and I can work on writing and my other podcasts on other days. DB: I tend to work similar to Mur, compartmentalizing my editing duties to one day per week (not counting email). I’ll often pick up stories to review while eating lunch or in the evenings, but other than that, my time is devoted to writing or other types of work. CS: I count 2 editors, a host, an assistant editor, an audio producer, a community manager, and 8 associate editors. Wow, does it really take that many people to generate a weekly podcast episode? Exactly who does what? ML: Since we deal with a large slush pile, and no one is making a living wage (and some are 100% volunteer), it’s definitely a relief to have a team backing us up. The associate editors are our slush team, our valiant volunteers. The audio producer finds the narrators and assembles the podcast. We split the hosting duties between the two editors and our one host for variety (and to not have to write a host spot every week). The community manager wrestles the forums (since personally I prefer Twitter as a way to communicate with people.) And our assistant editor manages the slush team and the flow of stories from slushers to us. DB: Part of being a SFWA qualifying market means being professional in our engagement with authors and delivery of content. After we migrated to using Submittable for our story and narrator submissions, our monthly input almost doubled. We also have quite a bit of turnover at our associate editor level, with many a slusher needing to move on after a year or so. We’re in one of those transitional periods, but even otherwise, we try to keep their loads light so they have adequate time to give every story a fair reading. In addition, our annual Artemis Rising month (to highlight authors who identify as women or non-binary) pulls away several members of the team who dedicate themselves to those submissions. CS: What’s the criteria for becoming an Escape Pod story? What type of stories do you target and what do you decidedly avoid? DB: Right now, the criteria is that Mur and I both like it. In general terms, we try to create some boundary conditions between us and the other Escape Artists podcasts, so we want stories where a science or technological element plays a fundamental role. The focus of the story might lie elsewhere, but as long as that SFnal aspect exists, we’ll give the story a chance. ML: I also like to consider the aspect of “fun,” but if a nonfun story knocks my socks off, I definitely won’t turn it down. CS: What type of gauntlet does a story go through from submission to posting? DB: Most stories go through 3 tiers. The associate editors get first crack at our slush pile, and each story will be read and reviewed by one of them. The assistant editor (currently Ben Kinney) then looks over the results, decides which stories to decline and which to hold on for review by Mur and myself. The final round stories must get a go-ahead from both of us. We have enough high-quality stories that filling our weekly quota has not posed a problem. Some stories take a shorter path when Ben, Mur, or I pick them up straight from slush. We might do this for a variety of reasons. The shortest of all is when we solicit reprints directly from the author. At that point, we’ve already decided to buy the story. Once we’ve accepted a story, it goes to the contracts team who handle the paperwork and payments for all of the Escape Artists podcasts. In parallel, our audio producer starts on the process of selecting and contracting a narrator for the story, and any text edits get sent to the author for approval. The final podcast is a concatenation of promotional spots, host segments, and story narration that’s edited and posted by our audio producer. CS: Looking through the list of Escape Pod authors, I don’t see the same names I see in the sci-fi magazines, ie, Asimov’s, etc. Is that deliberate? Do you prefer unknown and lesser known authors? ML: (laugh) Are you asking if we deliberately don’t publish Elizabeth Bear or David Gerrold? No, it’s not a deliberate decision to ignore the bigger writers. Remember that it’s not always the editors’ decision what gets published – if authors don’t send us anything, we can’t publish them. A lot of authors don’t know about us, aren’t interested in Creative Commons or audio distribution, or know they can make more money elsewhere. We’re an indie magazine driven only by donations, and aren’t backed by a larger publisher. Anecdote: A while back I was at a con and tried to solicit a story from a big author (no, I won’t name them) and they frankly (and politely) told me they get so many solicitations that they have to charge $.25 a word. We would very rarely pay that much, so we usually end up publishing a lot more reprints from bigger names than we do originals. That said, we are a SFWA pro market, and we love giving newer authors their first sale, and we hope to become a place where marginalized voices will feel comfortable soliciting to. DB: I will add this: Escape Pod has evolved over its lifetime, and the larger community hasn’t always kept up with those changes. We’re working to address some common misconceptions that are holdovers from the past. For example, every new episode is available (in full) as text on our website. We accept original stories – and pay professional rates for them – as well as reprints, paid with a flat fee. Alasdair Stuart has a wonderful blog post on this topic that I encourage everyone to read: “The Top 5 Myths about Escape Artists”. 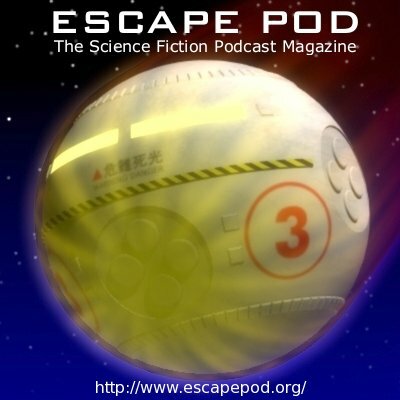 CS: How does Escape Pod distinguish itself from other sci-fi podcast sites? DB: We run exclusively short fiction, we hand-select the best narrator for every episode, and we have a round-table of hosts who discuss what that week’s story meant to them. That has been Escape Pod’s focus from its inception, and that will continue to be so. Other podcasts are doing great work, but I think we occupy a unique, trusted space with our listenership in part because of our consistent history. CS: What’s the status of Mothership Zeta with Mur gone? CS: What’s on the horizon for Mur Lafferty and Divya Breed? ML: The book based on my podcast I Should Be Writing will be out in August. I’ve wanted to write this book for years, and so glad I finally got the opportunity. I’m editing the space marine midwives anthology along with Cast of Wonders editor Marguerite Kenner, and I continue to podcast. As for writing fiction, I’m working on several proposals to throw at my agent, hoping for another book project in the near future. DB: I’m chipping away at a full-length novel and, of course, learning how to be the best co-editor of a podcast magazine that I can be. I have short stories forthcoming in Apex Magazine and an anthology of Asian science fiction called, Where the Stars Rise. I’m also traveling and making local appearances to promote Runtime, including Worldcon and FenCon. This will be my first Worldcon outside of the USA, and I’m excited about that. In terms of Escape Pod news, we’ll be closing submissions for the month of August, then reopening in September to general submissions as well as our open call for Artemis Rising 4. We’re also looking forward to our 600th episode this November, and we’ll celebrate the occasion with something special! ML: We will both be at Worldcon, so please come say hi to us! This entry was posted in Sercon and tagged Carl Slaughter, Divya Breed, Escape Pod, Mur Lafferty by Mike Glyer. Bookmark the permalink. Really interesting interview, thanks Carl and the EP team. It’s a bit sad to hear that Mothership Zeta is no nearer to a return, it had a really fun and individual voice.